With all this talk of recording and rediscovering the home front landscapes of World War I, I thought this would be a good point to have a ponder about the home front landscapes of World War II instead. In Britain, we've been lucky; the last battle on British soil took place in 1746 at Culloden. We have no historic battlefields of 19th or 20th century date at all. Our experience of World War I was largely vicarious, barring occasional naval bombardment and a little limited bombing (remind me to tell you the story of how my great-grandfather got a medal for not shooting down a zeppelin). The landscape imprint of the Great War is largely confined to the run up to combat (training camps; practice trenches) and the aftermath (hospitals and war graves / memorials). The same is true to a certain extent of World War II. 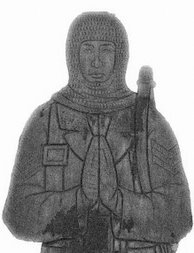 Again, there was no land-based combat on UK soil (unless Went the Day Well and the Eagle has Landed are true). The direct experience of the destructive power of modern warfare was however felt through the impact of the bombing raids. Obviously these were most extensive in the Blitz over London – my great-grandparents lost their house. But many other places, Coventry, Bristol, Cardiff Liverpool and other great industrial cities were heavily hit. Even smaller towns such as York felt the impact of the Luftwaffe – my daughter's school was substantially rebuilt following the Baedeker raid on York in 1942. These not surprisingly had a massive physical impact on the fabric of British cities and these structural and social effects were recorded by artists during and after the bombings. However, I've been increasingly coming across another dimension to the landscape experience of the World War II air war. I'm currently reading a book by HE Bates called “In the heart of the country” written in 1942 about living in Kent during 1941. It is primarily a book about nature and rural life, but the war keeps on breaking through the surface. He encounters evacuee children, meets squaddies fishing, records a crashed German bomber and a dogfight over the village resulting in a Messerschmidt being shot down. For Bates, the “memorable hot beauty of that summer was sharply impregnated by the prick of destruction”. The con-trails also make an appearance in the wonderful woodcuts by C F Tunnicliffe that illustrate the book, including my favourite image, of a man lying on his back looking over the Kent countryside with the vapour tails like spider scratches at the top of the picture. 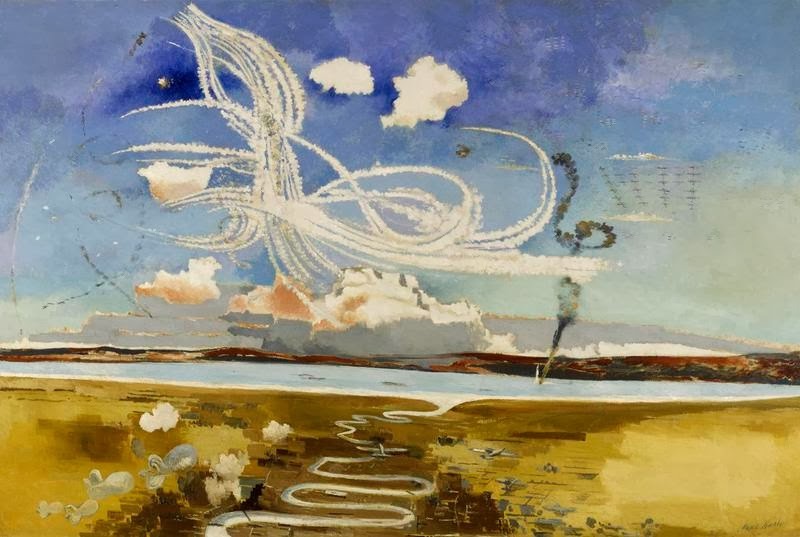 These vapour trails not surprisingly appear to have had quite an impact on those who observed them, and they appear several times in art and film in the early 1940s. 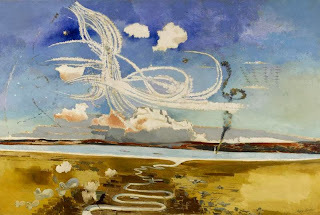 The best known example is the painting Battle of Britain – by Paul Nash (Yes him again), which although as is typical of Nash's post-WWI work is balanced on the very cusp of surrealism, depicts the con-trails of dog fights over the Channel. 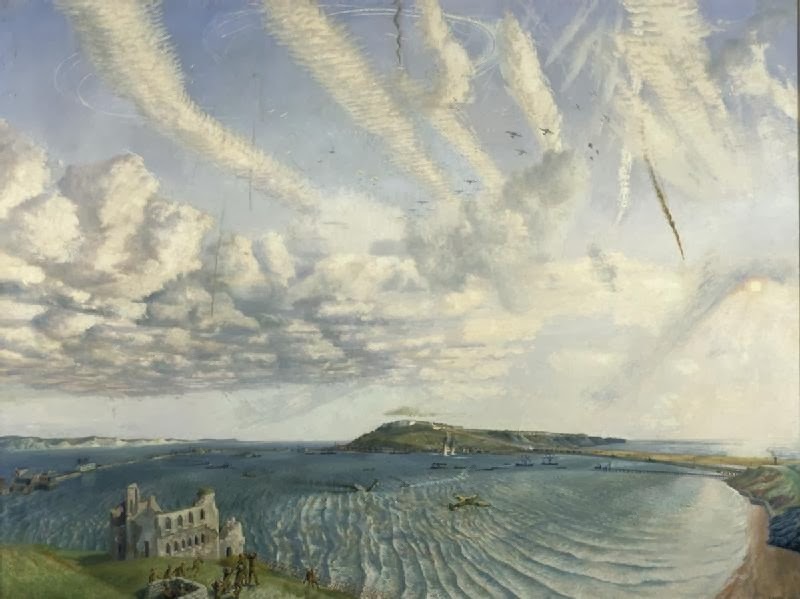 Vapour trails also appear in the work of other war artists, such as Richard Eurich, who depicted them on the south coast in his painting Fortresses over Southampton Water and Airfight Over Portland, and Walter Monnington's Southern England, 1944. Spitfires Attacking Flying-Bombs. A classic filmic depiction of con-trails I've come across recently is the Noel Coward war film “In which we serve” (a film, which incidentally, should have won an Oscar for Best Supporting Trousers). At 1hr24min50s into the film, a frightfully dapper Capt Kinross (Noel Coward), his cut-glass Mrs (Celia Johnson) and family have a picnic and watch the vapour trails of a dogfight going on overhead. 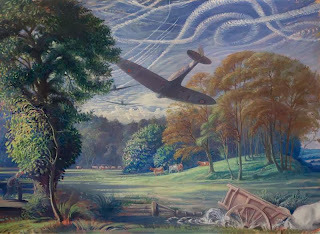 [I did go back and check the famous opening sequence of Powell and Pressburger's A Canterbury Tale, with the famous jump cut from a diving medieval kestrel to a Spitfire, but sad to report, no vapour trail).